As Lionsgate films continues to release still images from the upcoming blockbuster adaptation of "The Hunger Games," one thing has become clear: all eyes will be on Effie. Elizabeth Banks plays the brightly made up and costumed adviser to Katniss (Jennifer Lawrence) and Peeta (Josh Hutcherson) in the highly anticipated film, and in this new photo, revealed as part of a viral marketing campaign, fans get another glimpse of the sheer eccentricity of her costume. Speaking to The Huffington Post over the weekend, Banks raved about the opportunity to transform herself. "A fun part of being an actor and a chameleon is taking on those looks," she said. 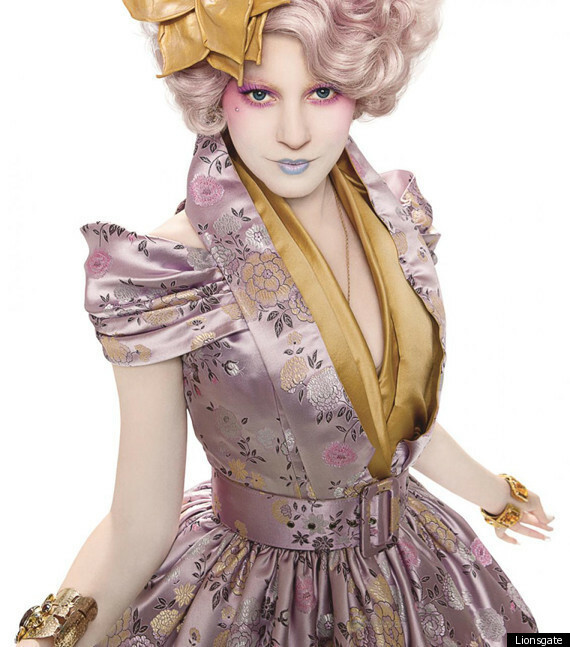 "Effie has a really theatrical, over-the-top, completely not me look to her. I'm very excited for people to see my portrayal. I have no idea if people are going to be into it. I hope they are. I know the filmmakers are and [the book's author] Suzanne Collins blessed everything we did. It was a really fun collaboration between myself and Academy Award-nominated hair and makeup and costume people." "The Hunger Games" hits theaters on March 23rd.